Fast-paced, lean and entertaining, Pierre Morel's District B13 (Banlieue 13, 2004) is an excellent stepping stone for international action films---and though it's certainly light on plot, the visuals and editing are strong enough to make you forget all that missing stuff. Needless to say, this is a film to show your friends, especially those new to the genre. The setting is Paris, several years in the future. District B13 is an especially rough neighborhood: buildings have been abandoned, crime runs rampant and the cops are looking to flush everything down the toilet. We're introduced to Leito (David Belle), a young man who's pissed off local drug lord Taha (Larbi Narceri) after a large stash gets destroyed. Leito is soon on the run from Taha's thugs, including K2 (Tony D'Amario), when his sister Lola (Dany Verissimo) is kidnapped. To get her back, he reluctantly joins forces with an undercover cop, Damien (Cyril Raffaelli), who's looking to bring down Taha as well. Soon after, the two heroes realize that the kidnapping is only one piece of a much larger plot, which may or may not involve a freakin' bomb. Part of what makes B13 so striking---despite falling into a few clichés along the way---is the overwhelming amount of physical stunts performed by the actors. Belle is the founder of "Parkour" (a physical discipline that emphasizes agility and finesse), which is used to maximum effect during the film. Utilizing this technique, Belle participates in chase and fight sequences that strictly revolve around the environment where they take place. He gracefully evades attackers by leaping across high-rise buildings, over railings, through small windows---you name it, he's probably gotten around it. As a result, the majority of action sequences rely on defensive maneuvers instead of traditional hand-to-hand combat. District B13 isn't without its share of punches and kicks, though, particularly due to the presence of Raffaelli. His background in martial arts and gymnastics makes him a logical partner for Belle, as his more forceful style of fighting breaks up the constant running and dodging. Though Belle's most exciting scene happens early on (a daring rooftop escape) and Rafaelli's comes soon after (a brutal fight in an underground casino), there's plenty of action that fills out the remainder of B13 nicely. Of course, the somewhat convoluted plot gets resolved before the credits roll---but we came here for the action, and it's delivered in spades. All things considered, it's a satisfying effort from first-time director Morel, though part of the credit should also go to writer/producer Luc Besson (Leon, The Fifth Element, the Transporter series). In their capable hands, B13 is elevated from camp classic into a genuinely entertaining action movie. You may want to check your brain at the door, but at least your eyes and ears will have a good time. The DVD does a capable job of holding its own weight, providing an excellent technical presentation and a good mix of bonus features. Let's take a closer look, shall we? Boasting crisp details and strong color, this 2.35:1 anamorphic widescreen transfer is a real knockout. It's obvious that such an action-packed film would need a superb technical presentation to back it up, and District B13 delivers on all counts. Digital problems, such as edge enhancement and pixellation, don't seem to be an issue at all. For those keeping score at home, this disc has also been THX Certified…you know, just in case. Presented in a Dolby Digital 5.1 EX mix (in the original French or an English dub), the audio presentation also packs quite a wallop. Surround activity is strong and dynamic, while a 2.0 mix in both languages is included for those with more modest setups. The dialogue and music are especially clean and clear. 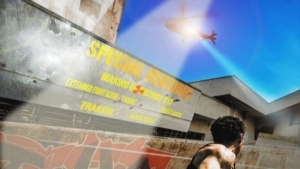 District B13 also includes optional English or Spanish subtitles for the main feature, along with removable English subs for the French-language bonus content. Unfortunately, to say the menu designs (and cover art) were ugly would be an understatement, though they're not too difficult to navigate if you turn your head a bit. This lean 84-minute film has been divided into a generous 16 chapters, while no obvious layer change was detected during playback. This one-disc release is housed in a standard black keepcase (again, with ugly cover art) and includes no inserts. Pretty standard stuff here, with one notable exception: an entertaining, in-depth Behind-the-Scenes Documentary (54:42) featuring interviews with the cast and crew of District B13. I was expecting little more than a fluffy, promotional featurette, but there's some great stuff here, including a closer look at the fight scenes, cinematography and post-production. Also of interest is an Extended Fight Scene (2:20) of the brawl at the casino, presented in rough but completed form; as well as an amusing Blooper Reel (2:55) with a few line flubs, dropped cell phones and botched stunts. Last and least is a short collection of Trailers for other Magnolia DVD releases (3 clips, 4:18 total). All extras are presented in non-anamorphic widescreen and include optional English subtitles when appropriate. It may not be highbrow entertainment, but there's no doubt that District B13 should appeal to fans of "highlight reel" action films like The Transporter series and Ong Bak: The Thai Warrior. It's a lean, tightly-wound film that wears a bit of goofiness on its sleeve---and at the very least, a terrific rental choice for the casual fan. The DVD presentation ups the ante with an excellent technical presentation and a satisfying batch of bonus features. All things considered, it's a solid package that's certainly worth looking into. Firmly Recommended. Randy Miller III is an affable office monkey based in Harrisburg, PA. He also does freelance graphic design projects and works in a local gallery. When he's not doing that, he enjoys slacking off, mocking passers-by and writing things in third person.